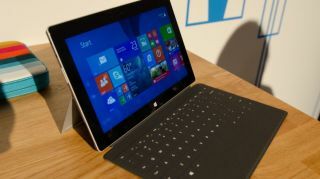 A Microsoft executive has finally admitted the existence of the Surface Mini and indicated that it will likely never land in our hands. Surface team lead Panos Panay revealed to Wired that he did in fact have a 7-inch Surface Mini that he used for note taking and drafting emails to himself in the middle of the night when ideas would wake him up. "It was like a Moleskine," Panay explained to the publication. "It was awesome." During the lead up to the Surface 3 launch, rumors of a possible Surface Mini began popping up and soon became one of Microsoft's worst kept secrets, even though it was never announced. There was even a guy who claimed he had actually played with the unconfirmed tablet. In fact, until today, it was never really confirmed by Microsoft's team, despite alluding to it in last year's earnings report when it was mentioned that the company had made the "decision to not ship a new form factor." Of course, the Mini never actually launched, and from what Panay says (or rather, his use of past tense), it sounds like we won't be seeing it in the future, either.